Attendees at the original FaffCon had nothing but glowing things to say about it. After all, how often do voiceover actors get to spend an entire weekend in the company of other working professional voice talent, much less actually sharing ways to improve our performances and business operations to get more work? I was unable to attend the first FaffCon, held last September in Portland, OR. To be perfectly honest, I don’t know that I would have attended the second one if travel had been involved. However, to my great delight, FaffCon2 was held this weekend in Atlanta. Add me to the list of the glowing FaffCon alumni! Not only that, but I’m already making plans to attend the next one! And yes — there WILL BE a next one, so keep reading! Let me start by saying that this or any other blog post cannot do justice to the event! I have pages of notes and a head full of great ideas about tactics to take my voiceover business to an even higher level. I finally met people in person whom I’ve known on-line for years, and I also made new friends. Most exciting of all, another participant had an amazing idea as a result of one of the sessions and asked me to collaborate on a new project! 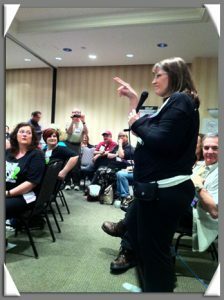 FaffCon Founder Amy Snively guides participants in Atlanta. FaffCon is the brain child of the vivacious and indefatigable Amy Snively. While FaffCon might seem like a big voice talent meet-up where people just schmooze with each other, it actually is a potentially life-changing educational event that requires tremendous planning and organizational skills. I am extremely impressed with how smoothly everything ran, and I don’t know how Amy possibly had time to sit and enjoy the sessions. Participants jockey to post topics and decide sessions to attend. Amy explained that we should think of FaffCon as a field of golden nuggets. You have golden nuggets to share with others, and you’ll get some in return. However, no one knows when and how those nuggets might turn up. You may not even know you received a nugget until you’re away from FaffCon and review your notes. Positive energy and synergy generated in the session that I led, “The Power of Your Words Away From the Mic”. I need to decompress, think carefully about what I heard, and develop an action plan to use the armful of golden nuggets that I received. As I said to a number of people over the weekend, everything about my voiceover business is an evolution. FaffCon was a much-needed jolt to help my business evolve exponentially instead of incrementally! If you’re a working voice-over talent who wants to improve your business, make plans NOW to attend FaffCon3 this fall! I hope to see you there! FaffCon logo for event scheduled 23-25 September 2011 in Hershey, PA. Thank you for this, Karen! I’m so glad you came to FaffCon 2 and I’m looking forward to seeing you again soon! Greetings, Amy! 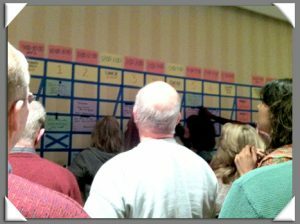 I found that Faffcon was a great way for me to create an action plan to improve my business. I’m still working on the things I added to my list from Faffcon2 and hope I’ll be ready for the next chocolatey pieces I’ll get at Faffcon3! See you soon in PA!